Ask fellow campers about "Old Chatham Road RV Campground" and nearby attractions. We stayed here in late September/early October. The park is primarily for seasonal mobile homes and permanent RVs; very few were actually occupied this late in the season (the Cape is a "summer location"). There are few temporary "RV" spots here. However, we were very happy with this park because it is in a super-quiet area and is full of beautiful trees; it is a lovely park. The seasonal RVs are mostly quite nice ones, too. This is a well-kept park. Though sites are a little close together, we had plenty of room for our 30 foot trailer and large truck. There as plenty of room to open our slides. There is a playground here and a nice walking path. There is basically no wifi-- you have to go to the club house or something like that; I just hotspotted into my AT&T phone, which worked fine. We camped at Old Chatham Road RV Campground in a Travel Trailer. This is primarily a summer residential camp. The toilets and showers are very old with few amenities. There was not even a hook in the shower. But there were spiders and moths. There were also lots of little worms dropping from the trees - something that would not happen all the time - we just managed to hit worm season. Very nice pool. We camped at Old Chatham Road RV Campground in a Motorhome. This park is not for actual campers. It is a mobile home park for permanent residents. There were few actual RVers and campers. There was very little, if anything, going on in the park. No activities. The bathrooms and showers were filthy, unkempt and unsafe. There was actually an electrical cord hanging in the women's shower without a GFI plug. Very unsafe. The internet access was extremely limited. Only 4 consecutive hours of Wi Fi and you needed to be at one location in order to receive it. It was not a good location to the area. We will Never return here. We camped at Old Chatham Road RV Campground in a Tent Trailer. 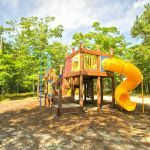 We chose this campground because of it's central location to see all of Cape Cod. The campground is older and has lots of permanent trailers throughout the park. The restrooms were outdated but clean. The office staff was friendly and helpful. It was easy access to all the areas and beaches we wanted to see. You could only get on the Wi-Fi in this tiny crowded, multi use building. TV reception was limited. We would stay here again. We camped at Old Chatham Road RV Campground in a Motorhome. This park is way overpriced for what is available. The only thing this campground had going for it was a decent looking pool which closed on Labor Day. Wi-Fi was available at a location near the office. About 90-95% of the sites were extended stay and the sites available to transients were difficult to maneuver into due to trees and other obstacles. Roads were paved and the sites were all sand or gravel, no grass. The park was not clean as there was litter in the site we occupied and the two adjacent sites. Upon arrival, we had to dump our tanks. The site had a connection which consisted of an 8 foot length of PVC pipe on an incline to the point where it entered the ground. When I dumped the tanks, a fair amount of waste leaked onto the ground from the elbow connection that entered the ground. I notified maintenance and was told that the system consisted of a pit that serviced 4 sites and another site had most likely recently dumped their tank and the system was overloaded. To minimize the problem, I was told to leave the waste valve slightly open during the extent of my stay. The aroma of waste was detectable for the 2 days of our stay. Needless to say, we will not return to this campground. We camped at Old Chatham Road RV Campground in a Motorhome. We made reservations 3 months in advance to stay at this park. We arrived at 4:50p.m. and the Office was closed. There was no arrival packet for us in the Late Arrival box, only a faded map with "pick any site" scribbled on top. We found an empty spot, but the cable did not work, the sewer connection was 35 feet from the hook up on our coach and the Wi-Fi is not free. They have TengoInternet at $5. for 24 hours. The site was dirt, narrow and it looked like a seasonal trailer had just pulled out. This campground is not set up for campers. It is 90% seasonals and 10% full time residents. We never did see the Management even on the day we left as the Office was closed again. We camped at Old Chatham Road RV Campground in a Motorhome. This is really more of a seasonal, than transient, park. Most of the sites are occupied by guests that leave their units year round, and have added decks, etc. We were there during April vacation, which is really before the start of most of New England's "camping season", so the park was fairly empty. Our site was very tight. We have a 30' 5th wheel with one slide and there was barely room for our slide and awning. The staff that we met were very friendly and helpful. Not much was open while we were there, but the Wi-Fi was working and it is free. 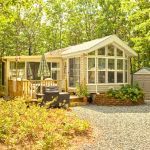 We stayed here because of the campground's proximity to the Cape Cod Rail Trail and used the campground as a home base to visit Provincetown, and take a ferry ride to Nantucket and for those reasons we were satisfied. I do not think I would have liked to be here when all of the seasonals are in however. The campers are packed in very tightly. Also note that Cape Cod has very strict rules about fires and that uncontained fires are not allowed at all. We camped at Old Chatham Road RV Campground in a Fifth Wheel. Park is not camper friendly. Rules are ridiculous. Management has a lot to learn. Don't go here to enjoy the cape fishing, as cleaning fish is not allowed. Children should always be accompanied by adult, children is anyone under age 21. I am a seasonal camper wishing things will change, but not for last 3 years. There is not much in the way of children's activities Cable only available with long stays. We camped at Old Chatham Road RV Campground in a Travel Trailer. Are you affiliated with Old Chatham Road RV Campground ?